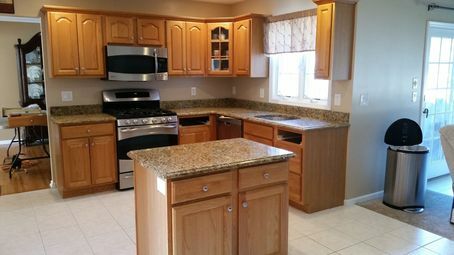 We’ve installed these beautiful Santa Cecilia Gold Granite countertops in Pompton Plains kitchen. This stone was the perfect choice for a classic kitchen design. The whole kitchen space embodies the earthy feeling, completely natural and universal. Santa Cecilia Gold Granite is stone quarried from the mines in Brazil. It is one of the best-selling granite countertops in the United States. The beauty of it, its incredible consistency, and generous and sufficient supply make this granite countertop one of the best-selling stones for the kitchens across the USA. Santa Cecilia Gold granite slabs are dense and thick, hard and heavy. This makes them even more beautiful. Each golden slab is different. You won’t be able to find two slabs that will look identical. Their striations, shades, swirls, and patterns will take a different course in each slab. Since Santa Cecilia Gold is considerably thick and dense granite type, it is important that your fabricator is confident in handling these countertops. The installation is very important if not crucial part of the kitchen set-up. This is why your granite fabricator needs to be highly skilled in handling this special stone. Our Aqua Kitchen and Bath Design CenterAqua Kitchen and Bath Design CenterKitchen and Bath Design Center team installed many times even the thickest and the heaviest granite countertops. Besides, we have an amazing selection of different Santa Cecilia Gold granite slabs at our slab yard. Once you pick and install your countertop, your fabricator should provide instructions and advice one needs about granite sealing and regular maintenance for the best results and complete satisfaction. Nice looking counter top from a distance. Would like to see a close up of the pattern. But have in mind that pattern and color can slightly differ depending on a slab.